If a full day’s work means a full day on your feet, you owe yourself comfortable safety footwear that can keep up. Enviro’s selection of PVC rubber boots, waders and steel toe shoes are designed to prevent you from slipping and sliding, even when you’re racing the clock. Smooth, nonporous materials, like rubber and PVC, provide waterproof protection while whisking away hazardous liquids, like oils and chemicals that can seep through other boots. Glide through your day with steel toe interiors that reduce the risk of injury from unexpected drops and accidents. Get shoes that work overtime to always keep safety one step ahead with these PVC and rubber boots from Enviro Safety Products. In your workplace, it’s imperative that you prevent slips and falls while protecting your employees’ feet from chemicals and toxic substances. At Enviro Safety Products, we know how important maintaining a safe workplace is to you because it’s also important to us. 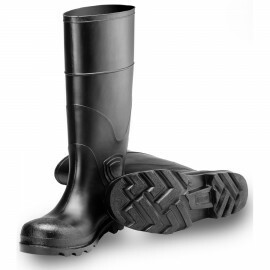 We carry a huge selection of PVC and rubber boots that are ideal for a variety of applications so you can rest assured your workers are getting the highest level of protection available. The protective boots in Enviro Safety Products’ extensive inventory are ideal for food processing, mining and chemical handling. Most of the safety boots in our catalog can be worn with other PPE, like disposable coveralls and lab coats, smocks and gowns. 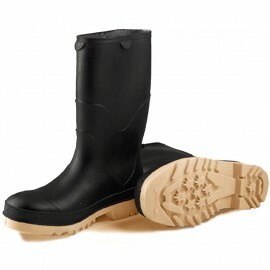 These cost-effective boots are also used in oil rig operations, dairies, breweries and other general industrial applications. The economical protective footwear and PVC boots in our catalog have superior resistance to animal fats (particularly poultry), acids, oils, greases and chemicals. 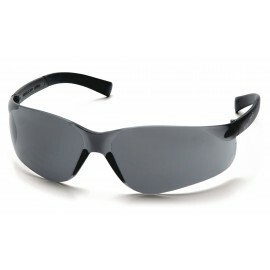 Some feature steel shanks for added arch support, while others have steel toes compliant with F2413-05. Some of our protective footwear comes with removable insoles, non-slip and self-cleaning soles, and cutoff bands for height adjustment. Ideal for work in the food service industry, agricultural operations and laboratory work, the PVC boots you’ll find here meet or exceed federal regulations for protective footwear. Most are available in a wide range of sizes and colors, so you can choose the perfect protective footwear for your workplace. When OSHA requires you to outfit your employees with protective footwear, protective clothing and other PPE, Enviro Safety Products is your one-stop shop. 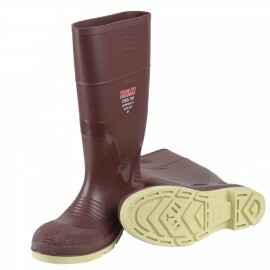 Our huge variety of affordable and economical PVC boots makes staying compliant while protecting your workforce easy.